Oppose Eric Dreiband for Assistant Attorney General for Civil Rights! Trump has taken great care to ensure that each of his nominees actively opposes the mission of the department they are appointed to. Eric Dreiband is no different -- Dreiband has been nominated to serve as the Assistant Attorney General for Civil Rights at the Department of Justice, yet he has built his career as an attorney supporting corporations over civil rights. Dreiband is the wrong choice to lead the Civil Rights Division at DOJ. He a represented a corporation accused of discriminating against a Muslim woman. And he was part of the legal team that represented the University of North Carolina when they fought the Civil Rights Division's attempt to block North Carolina's infamous transgender discrimination law. Beyond his professional capacity, he has committed his personal time and energy to testify and speak out against protections for women, older workers, people of color, and LGBTQ Americans. 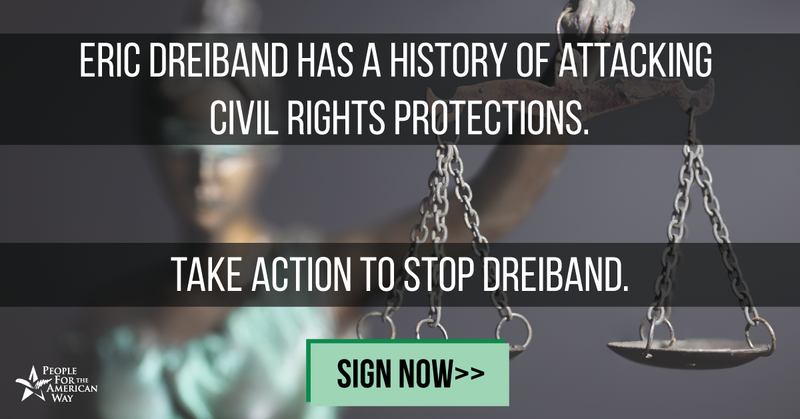 Urge your senators to OPPOSE Eric Dreiband for Assistant Attorney General for Civil Rights!